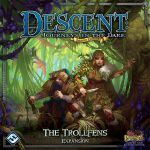 Description from the publisher: Trolls and ogres are two of the largest and most belligerent monsters in Terrinoth. Only their age-old hatred for each other has safeguarded the innocent from their depredations. Now, this ancient war has been supplanted by a budding alliance. 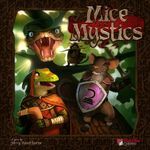 In Visions of Dawn, you can lead an army of ogres and trolls to rampage across the land, or you can be one of the noble few to stand in their way. 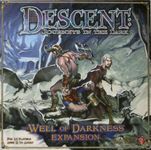 Visions of Dawn offers ten plastic figures previously only available through the first edition of Descent. You may take up arms with four heroes of the realm: Master Thorn, Nara the Fang, Ispher, and Sir Valadir. You may play as the overlord, commanding a monstrous legion composed of ogres, trolls, and manticores. To expand your experience as hero or overlord, this Hero and Monster Collection offers two brand new quests, Trucebreaker and Visions of Dawn, each challenging you to quest and battle for the future of the realm.